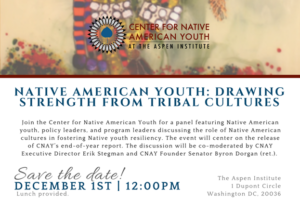 Join the Center for Native American Youth for a panel featuring Native American youth, policy leaders, and program leaders discussing the role of Native American cultures in fostering Native youth resiliency. The event will center on the release of CNAY’s end-of-year report and highlight data gathered from the inaugural Generation Indigenous Native youth survey. The discussion will be co-moderated by CNAY Executive Director Erik Stegman and CNAY Founder Senator Byron Dorgan (ret.). Lunch buffet provided.